Wide selection of styles and colors to choose from. Simply click on an image for more details. New additions to our product line! 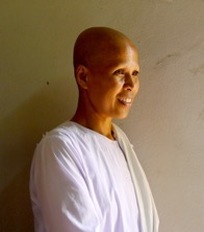 ​Sanom Pintho (Yeck), 54, is also a Buddhist nun and came to live in Padaeng temple with her older sister. She and her sister Lai are inseparable and work on everything together. Yeck enjoys being able to work in the same place where she is living and likes leading a simple weaver’s life. She agrees with her sister that the difficulty of the styles they make for Warm Heart depends on the materials. Although she says the scarves are beautiful, she would not wear them herself but prefers making her own designs which suit her personal style more. She’s happy with the payment she gets from Warm Heart. Most importantly, she enjoys the work because she is given ample time for the weaving and with Warm Heart’s orders, she doesn't have to worry about financing production or selling.